Two weeks ago, we had our open house. I had to be there from 9 a.m. to 6 p.m. every day for a week. There was no time for me to run out for lunch so I ended up having to pass fast food drive-throughs on my way to the project site. One can only have so much junk food at a time, and I definitely reached my breaking point. Man, did I feel sick and guilty that week! There’s just a weird taste left in my mouth at the end of the meal, and the food didn’t sit right in my stomach. I don’t even want to look at another McDonalds burger or Jollibee Chickenjoy (which I had twice). So last week, I decided to do a cleanse. I made sure to schedule the cleanse for when the husband was out of town, otherwise I’d have to cook meals and be tempted to eat. 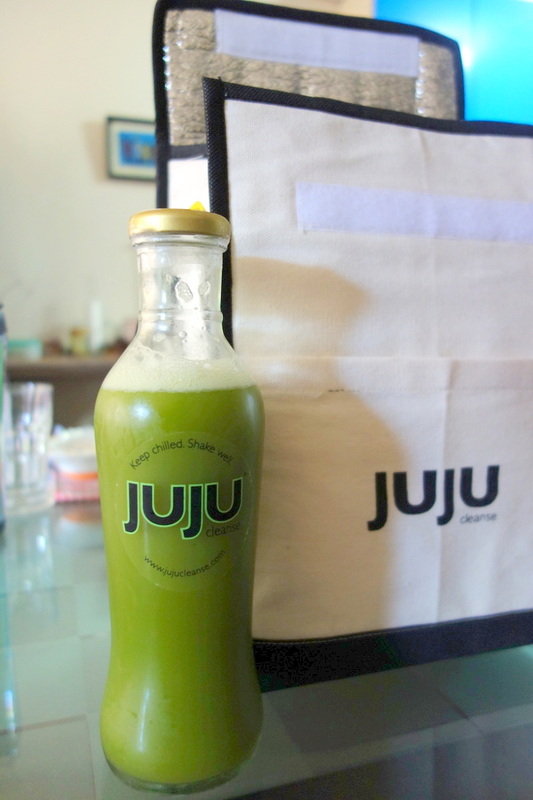 A friend of mine posted a photo of a bottle of Juju Cleanse on Instagram and I was intrigued so I looked it up online. I ordered the Level 1 1-day cleanse kit soon after. They delivered the juice to me the day after I deposited the payment. 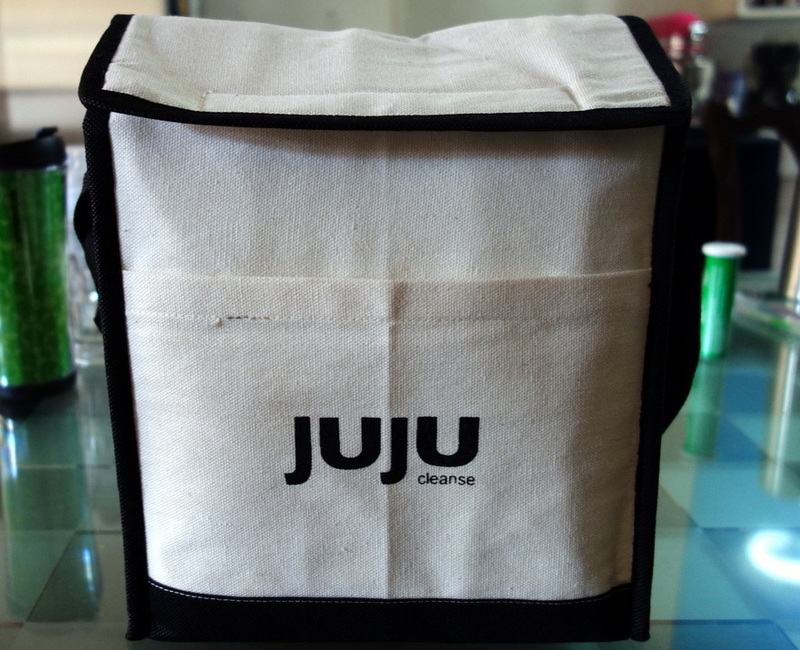 It comes with a case that carries the six bottles, each labeled with a number from 1 to 6, which constitute my meals for the duration of the cleanse, and a schedule of when the juice should be consumed. Super easy! Let’s see if I last the day without food though. So I opened the carrier and there are 6 bottles in it, The first bottle is up. It’s quite good. The color makes it seem more intimidating than it tastes. Very strong taste of celery, with a hint of apple and sweetness at the end. I’m in the middle of a meeting and I whip out my second bottle. There’s a slight tanginess, more like watered down calamansi juice, but with a bit of a zing with every swallow. I’m not hungry but boy, is my stomach growling! I was supposed to drink this at 12:30 p.m. but I had to put Bea down for her nap. She’s still awake but I’m starting to get dizzy already. It’s a bright red juice and most certainly has beets, which I can taste the earthiness of. Not my favorite. It also has pineapple, carrot and ginger juice apparently. Once I’ve downed it though, the dizziness disappears. I like this one the best so far. It has grapefruit, pineapple and coconut juice. I’m really surprised that I’m not at all hungry. This is amazing. Problem is, there’s kamote-cue for merienda and I’m going to have trouble resisting that. Wow. I did not allow myself to be tempted by the kamote-que, although it was calling out “Eat me!” I’m not in the least bit hungry. But am headed out to a Japanese dinner with my mom and someone whose we used to stay at in Frankfurt. Good luck sticking to just salad. It was a little too watered down for my taste. I have no self-control whatsoever. I ordered a chirashi don and finished every bite, plus uni and salmon sashimi and nigitoro. But, man, I’ve never felt so guilty ordering a meal! So that was my cleanse day. The verdict? I’m going to do it again, and stick to it for real. Maybe I’ll make it a quarterly thing though, because at Php 2,700 per 1-day cleansing kit, I’m going to go broke if I do it more often than that.